The website will collect details and information regarding to your own personal details. This includes information provided to us by yourself and through analysis of traffic on the website, which includes using cookies. A cookie refers to a price of information that is placed on to the hard drive of your computer by the web browser that you use. When you revisit the site, your cookie may be recognised by our server, providing us with information regarding the last time you visited the site. Cookies can also be used to store information which enables or disables social media pop-ups. The majority of browsers accept cookies automatically but it is possible to alter your browser settings to ensure that cookies are not automatically accepted. If you decide against receiving cookies, there may still be some elements of the website you can use. We use the information provided by you and collected by us in a number of ways. We use the information to enable us to develop and design the website in a way that is enjoyable and useful for you. We use the information to provide you with services and information that is of interest to you. This information is sometimes used by us and at other times it is sometimes used by associated companies to provide you with information, products, services and notifications about website changes that may be of benefit or interest to you. If you would prefer not to receive this information please send an email to Basketball Betting stating so. Users wishing to take part in our Tipster Challenge should be aware that an account is needed for this service. 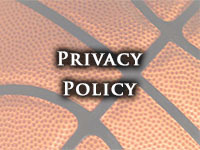 We provide basketball betting odds to our customers and these odds are automatically checked multiple times every house. However, visitors are advised to visit the stated sports book and check the actual odds at the time if they are looking to place a bet or remain up to the date with the latest odds. We will sometimes offer aggregate statistics about the services, traffic patterns, competitions, clients and additional site information to third parties, but these statistics will never include any information that could personally identify you. In the event that your personal details become inaccurate, incomplete or even untrue, you have the right to gain access to these personal details and then rectify them so they are correct. Your use of the website is an agreement that you are fine with us, third parties and associated companies contacting you and that you do not consider this contact to be a breach of your rights under the Telecommunications (Data Protection and Privacy) Regulations 1999. We reserve the right to disclose information that has been requested in order for us to comply with any applicable laws, government requests or police investigations into suspected illegal activities. We also reserve the right to provide and disclose identifiable information to any third parties if there is a complaint made about your use of the web site and any use that is considered to be inconsistent with the terms and conditions of the website. We have legal obligations to you with respect to any information that is supplied to the website. We are duty bound to collect this information in a fair manner, we are duty bound to explain how this information shall be used and we are duty bound to inform you if we aim to provide this information to any other party. Any information provided to the website, in general, will only be used by ourselves and noted agents and service providers. However, we have the right to disclose information or material by law. We reserve the right to remove any offensive, objectionable or inappropriate content and any disruptive behaviour can lead to information being passed to third parties such as your internet provider and law enforcement agencies.